All group reservations must pay the balance in full on arrival plus a security Bond. Under 16's must be supervised at all times in the Hotel. No Smoking in any part of the Hotel. Changes in numbers can be made up to 14 day before arrival, otherwise the total balance MUST be paid. In event of cancellation within 28 days of arrival, the first night will be charged to the card used to make the reservation. All groups require a security bond which is typically 20 per head. Any student groups will be asked for I.D before being served alcohol. Any groups of over 6 persons must reserve a dorm or rooms sufficient to exclusivly contain that group. 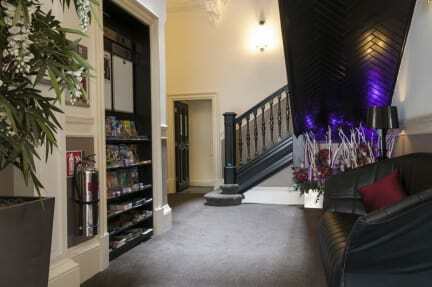 The West End Hotel is located in a B-listed Victorian townhouse only 15-minutes walk from the West End of Princes Street, the perfect base to relax yet within easy reach of all that Edinburgh has to offer. We offer simple, quality accommodation for guests that want to make the most of their time exploring Scotland’s capital. 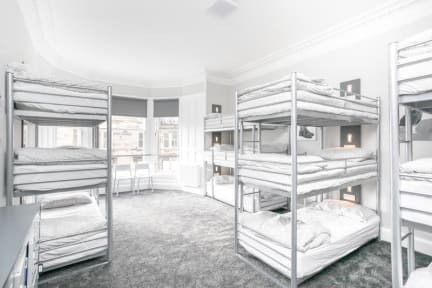 After a full room refurbishment in 2018, The West End Hotel Edinburgh offers modern and bright DORMITORY rooms which are comfortable and welcoming. Choose to stay in either one of our small 6 bed dormitory rooms with En-suite or one of our larger dormitories with shared bathrooms, you won’t be disappointed! Sleeping a total of 109 guests, the West End Hotel has the capacity to cater for large groups including school/university groups or sports tours. We have 10 dormitory style shared accommodation rooms to choose from, each varying in size from a 6 bed to a 10 bed dormitory En-suite, and our 18 or 24 bed dorms with shared bathrooms. All our rooms offer wall mounted Triple Bunk Beds. Please note we cannot accept anyone under the age of 18 in our dormitory rooms (with the exception of private groups who are travelling with teachers or adults). Children under the age of 18 are only permitted if reserving a whole dorm room for exclusive use and travelling with an adult. •Hair dryers and straighteners available throughout bathrooms and Vanity areas. PLEASE NOTE that there are limited electrical sockets in the dormitories. These plugs can only be used for charging mobile phones and laptops. Using these plugs for anything else will automatically shut off the power. Items left to charge are done so at the owners own risk and the hotel cannot be held responsible for any items in the rooms or the public areas. There are extra sockets in the public areas. We ask guests to please remove items when they have finished charging to allow other guests access to the sockets. If cancelling any bookings for these dates we require no less than 2 weeks notice for there to be no further charges made to your credit card. Cancelling within 2 weeks of your arrival date will see the total remaining balance of your bill charged to the credit card details provided to us with your booking. All other cancellations must be received by 2pm, 2 days prior to your arrival date to prevent any penalty fees being charged to your credit card. If you have booked with an agent online or in person, any deposit made to them is non-refundable unless this has been previously arranged with them. Cancelling a booking within 2 days of the arrival date or failure to arrive at the hotel on your booked day of arrival will see the equivalent of one nights room rate charged to the credit card details provided to us with the booking and your booking will be cancelled for any further nights you have booked. Any guests arriving after 11pm Sunday to Thursday and after Midnight Friday and Saturday will be required to pay a £5 late arrival fee to the member of night staff. Please note this is a one off fee of £5 and not £5 per person. Please note that if you are a group of 8 or more people you will be asked to pay the remaining balance as a group (not individually) and leave a £20.00 security bond per person on arrival. This bond will be returned on departure once the room/s have been checked by a staff member. Please note that you should allow time for your room to be checked on departure as this can take up to 15 minutes, if you fail to leave time for your room/s to be inspected bonds will not be returned. If we require any damages to be inspected by the owner, bonds will be kept and returned to you at a later date once a price has been determined for the damage. Disturbing other residents will also result in a penalty charge, the amount will be determined on a case by case basis. Upon arrival at the hotel your group will be asked to read through an introduction letter which lists damages and penalty charges as a guide only, the hostel reserves the right to change these at any time without warning. Unfortunately we are not able to accommodate stag or hen groups in the hostel. Cancelling group bookings - If you are a party of 8 or more people our standard group cancellation policy applies. Cancellations must be made no later than 2 weeks prior to arrival or 1 nights cancellation charge applies for the entire group cost.